Fusion-Tech UV Black Piping by aquatechnik NA has quietly been creating tremendous ripples in the industry! It is the first fusible polypropylene pipe solution featuring UV protection, meaning workers will instantly see a considerable reduction in the number of labor hours plus a huge improvement in installing whenever they are working with outdoor fusion pipe. Furthermore, the need to paint the pipe for better UV protection is eliminated entirely. Built for long-term durability, Fusion-Technick UV Black Piping utilizes the highest level of polypropylene and it is still the sole industrial strength pipe of its kind. Fusion-Tech UV stabilizer has been put through an extremely rigorous amount of testing to just about guarantee what is essentially the most outstanding UV resistance presently available on the market. It is also designed to resist cement, plaster, and electrochemical reactions. Besides its installation efficiency, the pipe can be welded or fused while forgoing pipe or fittings treatment. It can be used to carry hot or cold potable or non-potable fluids, it works well for industrial applications, and it maintains a strong degree of versatility. 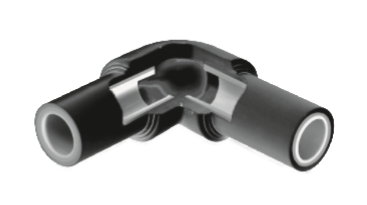 If you want to learn more about Fusion-Tech UV Black Piping, please visit the MIMECO product page or give us a call.